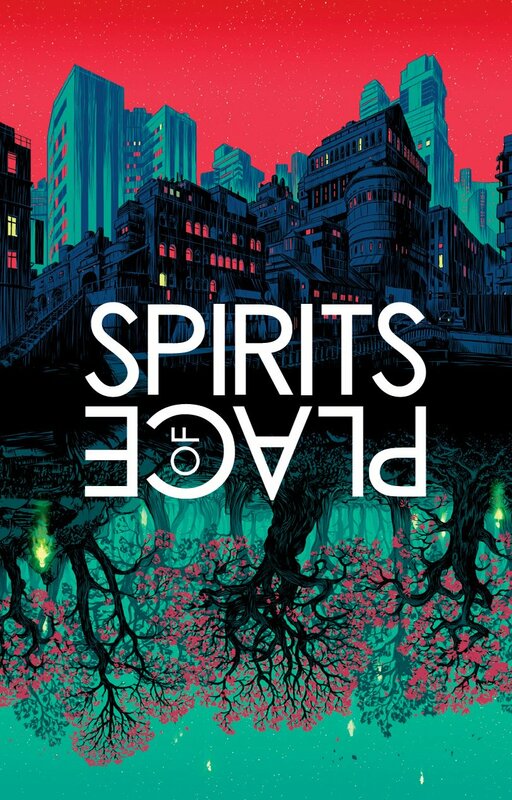 If you’ve been spending any time online in the past few weeks, then chances are good that you’ve heard about Spirits of Place, the new book edited by John Reppion and put out into the world by Daily Grail Publishing. It’s caught the attention of the likes of Guillermo del Toro, Boing Boing, and Blair MacKenzie Blake of ToolBand.net and we’ve even discussed it in the Technoccult Newsletter. Stories are embedded in the world around us; in metal, in brick, in concrete, and in wood. In the very earth beneath our feet. Our history surrounds us and the tales we tell, true or otherwise, are always rooted in what has gone before. The spirits of place are the echoes of people, of events, of ideas which have become imprinted upon a location, for better or for worse. They are the genii loci of classical Roman religion, the disquieting atmosphere of a former battlefield, the comfort and familiarity of a childhood home. Twelve authors take us on a journey; a tour of places where they themselves have encountered, and consulted with, these Spirits of Place. Contributing authors: Bryndís Björgvinsdóttir, Vajra Chandrasekera, Maria J. Pérez Cuervo, Warren Ellis, Alan Moore, Silvia Moreno-Garcia, Kristine Ong Muslim, Dr. Joanne Parker, Mark Pesce, Iain Sinclair, Gazelle Amber Valentine, and Damien Williams. Edited by John Reppion. It is a truly beautiful book with an awe-inspiring writing lineup, and I am honoured to be a part of it. I got the chance to do a tarot reading for John Reppion, the mind behind both the book and the event Spirits of Place. Beneath the cut, you’ll find his extremely detailed considerations on everything from magick, to art and creativity, to family, to work/life balance, and quite a lot of thoughts about how all of those things intersect. I spoke with Klint Finley, known to this parish, over at WIRED about Amazon, Facebook, Google, IBM, and Microsoft’s new joint ethics and oversight venture, which they’ve dubbed the “Partnership on Artificial Intelligence to Benefit People and Society.” They held a joint press briefing, yesterday, in which Yann LeCun, Facebook’s director of AI, and Mustafa Suleyman, the head of applied AI at DeepMind discussed what it was that this new group would be doing out in the world. This isn’t the first time I’ve talked to Klint about the intricate interplay of machine intelligence, ethics, and algorithmic bias; we discussed it earlier just this year, for WIRED’s AI Issue. It’s interesting to see the amount of attention this topic’s drawn in just a few short months, and while I’m trepidatious about the potential implementations, as I note in the piece, I’m really fairly glad that more people are increasingly willing to have this discussion, at all. To see my comments and read the rest of the article, click through, above. If you look at the painting, illustration, and figure drawing work of Eliza Gauger, you wouldn’t be wrong if you thought you saw the visual influence of the likes of Egon Schiele, and an overall thematic investigation of the grotesque. Additionally, Gauger’s work on the absurdist Jerk City comic showcases a familiarity with both Dadaism and meme culture, but basically the opposite of how pretentious that makes it sound. On top of visual art, Gauger has done work in music and been an active and charismatic figure online for over a decade. But the project that’s been taking up the majority of their time, lately, has much more in common with chaos magick and the works of Austin Osman Spare than their previous endeavours. Since 2013 Gauger has been creating Problem Glyphs, through the process of leaving their Tumblr ask box open to anonymous comments, and reading the problems of those who offered them up. Gauger then created visual representations of sigilized imagery, meant to evoke the shape of and the path through the issue. I’ll let them tell you more about it, below, but the long and the short of it is, Problem Glyphs were a runaway success. The Problem Glyphs art book contains 100 glyphs and their associated submissions, accompanied by an introduction by Eliza Gauger and a foreword by award-winning writer, Warren Ellis. Problem Glyphs will be a premium edition, display-worthy art book, measuring 10×12″ and featuring a Smyth sewn, genuine clothbound hard cover with gold foil-stamped cover illustrations. The estimated 220 interior pages will be printed on beautiful matte coated art paper. Tremendous care has gone into every aspect of the book, from its binding to its typography, the beautiful and storied Doves Type. I got the chance to have a tarot-based conversation with Eliza Gauger, to discuss the origins, impact, and future of Problem Glyphs. Since 1989, FoolishPeople have been creating extraordinarily complex, intricate worlds of immersive performance magic. They’ve been commissioned by the Institute of Contemporary Arts, Arcola Theatre, Secret Cinema, the BBC, and the Wilderness Festival. John Harrigan is artistic director and cofounder of FoolishPeople and we have been trying to find the time to get together and have a bit of a chat for quite some time, now. With recent world and personal events being as they are, we eventually came to the realization that there would be no time like the present. On a personal level, John and I have both experienced monumental losses, in the course of the past year, and it can easily be said that they’ve transformed us in some unexpected ways. We’ve also both been given new and unprecedented opportunities, and so now seemed like the perfect time for Technoccult and FoolishPeople to meet. John’s raw openness about life, art, magick, and the process of creating living, immersive theater is amazing, and really made this interview process something special to facilitate. Speaking of, let’s take a minute to talk about the process of this interview. I wanted to come up with a format that would do justice to the mythic otherworldliness that FP manages to breathe into every one of their creations, and eventually I settled on using Tarot in a traditional cross and staff formation to devise and guide the questions . Each answer got followed up with another clarification question, determined by another drawn card. First ten cards and questions, John’s answers, second ten cards and questions, John’s answers. To frame the whole process, I intentionally opened with the Fool and closed with the World, the first and last cards of the Tarot’s Major Arcana. My questions are in bold, and John’s answers are in plaintext. As a fun side note, the deck I use is the Dave McKean-illustrated Vertigo Tarot. When I showed him the pictures of the spreads, last week, John informed me that this style of deck was the first he ever owned. KF: I kind of see this book as a users’ guide to the human brain. The brain, the missing manual; that sort of thing. What is the book, in your own words? Maybe we’ll start with Taylor then Bill can chime in. It’s been a long road to get this book put together. I mean, it’s turned into three e-books and a workbook which speaks to it. So what do we see it as? I think I see it as a catalog of certainly stuff related to the brain but really behaviors and actions that can come out of being more aware of the brain and how it programs a lot of our behavior. That’s my take on it. Bill, what would you say to that? BW: Well, I think we’ve tried to produce a taxonomy, a way of categorizing behavioral practices, things that can be described in purely behavioral terms; that actually have a measurable neurological effect on people, physiological effect on people. Things that you can learn to do that could be said to truly impact your skills as far as fundamental human activities; things like concentration, memory, metabolism; things that impact pretty much anything you would want to do in your life. We’ve tried to abstract that as much as possible from any specific tradition because in many ways, the traditions these things come out of have a tendency to separate out people as much as they bring them in. Someone will say, “Well, psychology is too cold or inhuman for me” or “I don’t do Eastern mysticism” or “That’s too fuzzy and spiritual”, any reason to not try the thing themselves, whereas in behavioral terms, these are things that you can learn to do that will change your level of skill as a human being. I sat down with a kid who wasn’t really doing well in school. He wasn’t talking to his dad and I asked his dad I was like “Well, how do you hang out with your kid?” and he says “Well, I don’t really know.” So, I saw the kid on a laptop and I said, “Hey, what are you doing?” and he said, “Well, I’m playing a game” and I said “What game?” and he said, “Club Penguin”. So, I logged on to Club Penguin on my laptop, got myself an account and I said “What’s your username?” and I literally just went in and joined the game with him. And of course I couldn’t show that I never played the game before so I had to catch on really quick. So, initially, what the kid did was, he didn’t really necessarily want to show me around. He just wanted to show me that he was really fast in it and kind of leave me in the dust, so I had to catch up. And so I caught up and I got control of my virtual self so to speak and then I was comfortable and then at that point I had proven myself and then he started showing me around. He said hey, let’s go over here and let’s do this and then we started doing all these activities together like sliding down a mountain or mining for gold, for instance. We could get upgrades which was difficult for me to watch and also participating. All these different things we ended up doing and then after a while he started telling me about school that day and how frustrated he was with students and just started spilling everything, just everything came out. It was the equivalent of me in the past being his dad and throwing a softball, a baseball to him. Doing something where you’re walking with somebody. You’re doing something tangential and suddenly all the information comes out. I later sat down and told his dad. I was like, he’s having trouble in school. Here’s why. If you want to hang out with him . . . you’re in computer software you should be able to figure out how to play Club Penguin. This week Chris Dancy and I talked to Shanley, a tech product manager and feminist in the Bay Area, about sexism and micro-aggression in the work place. KF: How can people be more aware of what’s going on there? I mean, one of the things I was wondering about when I read it is how often managers are really intentionally doing this because I imagine there’s some element of desire to be the boss and express power in those ways but I’m guessing actually that there’s a fair amount that’s completely subconscious and that if managers were more aware of they actually would perhaps not do these things. First of all, do you agree that some of it is unintentional and secondly like how can people become more aware of this stuff? CD: One of the things I heard Shanley you say was when I become or when we become managers the things we observe so I think to Klint’s question is some of this just kind of picked up like lint on your mind because you’ve watched people manage? SK: Yes absolutely. I think we tend to emulate what we see around us, we tend to try to emulate and live up to the mythologies around us. I think that most this type of behavior is not conscious at all. No one is sitting there thinking how can I make my team feel bad, how can I make them feel inferior, how can I make them feel less than … but there’s something amazing about that realization because it starts with this realization that like managers have a profound impact on the lives and experiences of their teams. We know this is true because when you ask people about bad managers that they’ve had you see the tremendous negative impact that managers can have and not just affecting you as an individual but ask someone’s partner, their friends about the bad managers they’ve had and they’ll give you an earful too. And then you talk with managers and they have this really strong desire to really help their team but there’s a disconnect going on there. When you can sort of star in this shared position of being like okay, like this is a really powerful space, the space of interaction is really powerful. It’s something that sometimes goes horribly wrong but no one wants it to you and how can we sort of start from that position of like good intention but more awareness and honesty. As always, you can find it on Soundcloud, iTunes or Stitcher, or download it directly. Show notes and transcript are here. If you missed me on 90.1 KZSU Stanford ThermoNuclear Bar last week you can now check it out on SoundCloud, or read the transcript below. We talked about the occult, conspiracy theory, EsoZone, Portland, Psychetect, Mindful Cyborgs, the Indie Web. S1: Where do you see then your variety of your projects going? I mean we have talked about this earlier. I had said that Technoccult was one sphere, and Psychetect was another, Mindful Cyborgs was another. If you saw any relation between the three other than just you happen to be in the middle or do you see any sort of end-goal coming up for you? KF: In terms of an end-goal, I think the purpose of all of these has always been to find some way to engage with other people in a way that’s meaningful for both of us. I guess, it’s kind of an abstract way of talking about it, but something like Psychetect is just a different way of expressing myself and hopefully of communicating with people. Things like Technoccult and Mindful Cyborgs are more directly communicative projects. I think the only thing that they all have in common is a general interest in thoughts and thinking and consciousness. I guess, the overriding idea of Psychetect is to kind of create audio representations of thoughts or of sort of mental spaces that I don’t feel like I can describe with words. There’s I guess an overlap with something like Mindful Cyborgs where a big part of what we’re talking about is what it feels like to think in a world where you’re always connected to the rest of the world via the Internet and everything you do is being measured by somebody. I should also mention that PDX Occulture is still sort of around, and that though EsoZone is gone, Weird Shift Con has emerged to fill that void (though I don’t have anything to do with organizing it). The second part of the Mindful Cyborgs interview with Alex Soojung-Kim Pang, author of The Distraction Addiction: Getting the Information You Need and the Communication You Want, Without Enraging Your Family, Annoying Your Colleagues, and Destroying Your Soul is up. CD: One more question on this concept: you speak of a digital Sabbath which I don’t know if you listen to the show of Nathan Jurgenson. Today, August 9th Nathan Jurgenson’s basically on Twitter having a minor meltdown listening to people struggle with what he calls digital dualism, so this pathologizing of an online versus offline reality. I don’t know because I’ve never asked Nathan how he feels about a digital Sabbath but I would think he would say is probably the most dualistic thing you could do. To that point I personally tweeted out recently celebrating your ability to unplug is the fastest way to declare a pathological relationship between yourself and your data. Are you pro-digital Sabbath because your mind just needs a break or I mean, do you literally think that we need it because this is so unhealthy we need to detach from it and make it something separate? ASP: First of, I think Nathan’s meltdown is a perfect example of why you shouldn’t go to academic conferences because there’s this sociological association like now. It’s a toxic environment so stay away. There has in the last few months been this kind of fetishization of digital detoxes. That’s an idea that the cool kids are putting their things down and they are going off to the woods and playing Shuffleboard. CD: It helps when you’re making $300,000 or $400,000 a year that you can put your phone away a lot easier by the way. ASP: Exactly. Yes. And the fact that there are a couple of Caribbean islands and some resorts in Tahiti and Thailand who are starting to advertise themselves as digital detox centers only adds to this, but this is to say that any beneficial activity can be turned into a status symbol. We’ve seen this with yoga, with organic food or sending your kid to a progressive school anything like this can be turned into a status symbol and I think that shouldn’t detract from recognizing a couple of things and one of them is that it’s totally reasonable to want to take a break from things that you love. I love my kids but they’re at camp right now and when I get up in the morning I was thank God, they’re at camp. I’ll have them be on 50 weeks of the year. It’s cool to have a little break. You can find the episode on Soundcloud, iTunes and Stitcher, or download it directly. Oh, and see also my article on Pang’s book.